Compassionate friends: Stanthorpe’s Sue Fleming (left) and Nicolette Kloppers. Photo: Selina Venier. 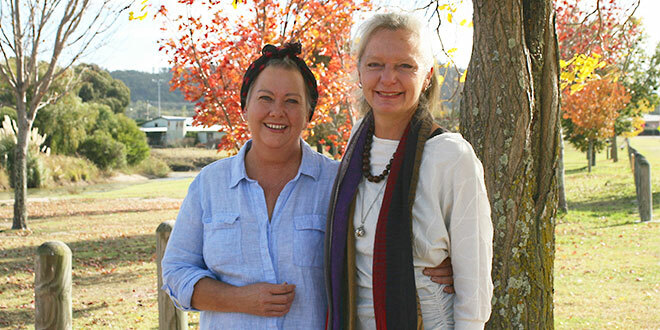 Sue Fleming and Nicolette Kloppers, who live in Stanthorpe, in Toowoomba diocese, are mothers who answer with certainty although it can be “an awkward question”. “People say, ‘How many kids have you got?’ and I always say, ‘I have four’,” Sue said. Sue and husband David’s lives were forever changed when their son Sean died in a day-care accident 20 years ago, a reality Sue said “never leaves”. “When Sean had his accident, he was our middle child,” she said. “I was very busy and had no choice but to get up, out of bed each day. David Fleming has taught at St Joseph’s School, Stanthorpe, for 31 years and, as well as Sean, the couple are proud parents to Liam, 27, Lachlan, 22, and their “little gift” Imogen, now 19. Sue, who specialises in childhood dentistry, knew her friendship with Nicolette Kloppers, also a mum to a fair-haired son called Sean, would be forever strengthened through their shared loss. Sean Kloppers died in a local accident in September 2016, two months shy of his 14th birthday. In contrast to the activity surrounding Sue after her son’s death, Nicolette, who has family in South Africa and daughters Natalia, 20, and Natasha, 18, who had moved to Brisbane to pursue university studies, went from “a house with three teenagers to living alone on 10-acres”. “After Sean’s death, we’d returned from visiting family in South Africa and I wanted to talk but I was on my own,” Nicolette, a high school teacher, said. “Looking for support on the Internet, I found TCF (The Compassionate Friends). TCF was founded in 1969 by two sets of parents in England who faced the death of their sons and became known to each other through a local pastor. Existing in Australia for almost 40 years, TCF cares for bereaved parents and families, offering 24-hour-a-day phone support and opportunities to gather in Brisbane, Caloundra, the Gold Coast, Hervey Bay, Gatton, Toowoomba or Rockhampton. Without a local group but able to travel two hours to Toowoomba on weekends, Nicolette soon had “an informal coffee” with four other grieving mothers and was grateful for an immediate sense of welcome and safety. “Dropping a hint” to Sue, who Nicolette said “is a great organiser”, the teacher was hopeful a support group in Stanthorpe would be possible. Sue was spurred into action but slowed by what she described as a “speed bump”. “The local group was going to be organised earlier but I got cancer,” Sue said with her distinctive chuckle. While in Brisbane for cancer treatment, Sue met with TCF leaders and progress towards a Stanthorpe group was evident, a date and time set for April this year. The meeting on the third Wednesday of the month was met with positivity and gratitude. “It was very raw, lots of emotions,” Sue said. “It’s a big step just to walk into a group like ours … (but) the great thing about the group is that there’s no judgement. “It’s good to be with people who can understand and not judge; that’s what’s needed. Sometimes you can say something and wonder, ‘Where did that come from?’,” Nicolette said. Those who attended varied in ages and backgrounds, from mothers who’ve faced having a stillborn child, to grandparents. 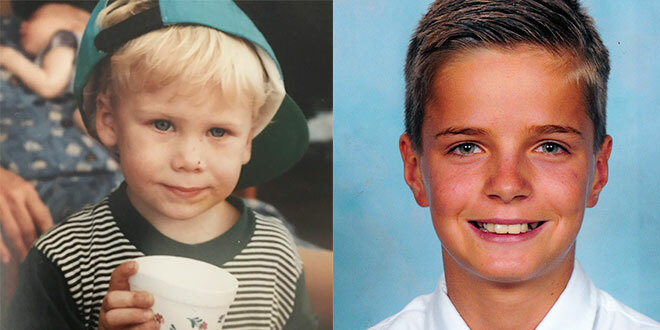 Young loss: Sean Fleming (left) and Sean Kloppers. While Sue prepares for the May 16 support group meeting of TCF in Stanthorpe, Nicolette has begun volunteering for the group’s helpline, inspired to connect and support where possible. “TCF has been such a support to me and I’m at a point if I can help other people, it’s of benefit to everyone,” Nicolette said. Another coping mechanism for Nicolette has been spirituality. “I’ve become a lot more spiritual since losing Sean,” she said. “I joined a Church and it was like walking into a family. The women recalled the visit of retired Stanthorpe priest Fr Lino Valente, who now lives in Toowoomba. He had offered Last Rites to 13-year-old Sean, assuring them of God’s unfailing love. Nicolette said the journey of grief had brought her to the certain hope she would be reunited with Sean, something she “strongly believes”. “I had to find my personal truth,” she said. “I had to answer the question of how I am going to live the rest of my life without my child. I had to find some hope that I would see Sean again. Day by day however, she recognises grief can “hit” anytime and “triggers will never change” simply taking each day as it comes. While she faces Mother’s Day today, and other significant events like Christmas, with a sense of “wanting it to be over”, Nicolette recalled the advice “of a wise, old man”. Sue and Nicolette spoke of “the parallels” between their sons. “They were both cheeky,” Sue said joyfully. “(And) I was always drawn to Nicolette’s Sean because he was just like my little man. “They were beautiful blonde boys,” Nicolette said, remembering a “gentle, caring and very attentive” son. The friends had their own advice for people who may not know how or what to say to them about the reality of losing their sons. “People find it hard to say Sean’s name,” Sue said of both their experiences. Sue said she considered herself “a good listener” and this too was valuable. “Sue’s listened to me for hours, she’s very good at that and I appreciate it,” Nicolette said. While Sue faces the future with optimism and positivity following her cancer scare, saying, “getting cancer was nothing like losing a child”, the women look forward to welcoming others into the TCF group in Stanthorpe and beyond. “I think we’ll always look at our son’s age group and wonder what they would be up to if still here,” Sue said. For more information about TCF go to www.compassionatefriendsqld.org.au or call (07) 3254 2657.